CHILLIWACK, B.C. — Owen Guy and Pierre-Luc Veillette are already teammates with the Ottawa Junior Senators of the Central Canada Hockey League (CCHL). They’ve still got a few more years together. The future Lakers, who appear to be joining the Lakers next season, reached the Royal Bank Cup, the top prize for all ten Junior A leagues in Canada, ultimately falling in the Cup semifinals. By putting together a 46-9-5-2 regular season mark that saw them place atop the CCHL’s Yzerman Division, the Junior Sens put themselves in great position for the CCHL playoffs. Ottawa then defeated Pembroke and Brockville before facing Carleton Place in the league final. The Junior Sens put an end to the four year reign of the Canadians, as they captured the Art Bogart Cup as league champs. Advancing to the Fred Page Cup, the Jr. Sens took first place in the round robin with two regulation wins and an overtime win. They punched their ticket to the RBC with a dominating 10-1 victory over Longueuil of the Quebec Junior Hockey League (LHJQ). Interestingly, the Junior Sens found themselves in the RBC semifinals with no regulation wins. Six of the ten games in the round robin went to overtime, including all four games played by Ottawa. The winners of the Fred Page Cup started off with a 2-1 win over the Ontario Junior Hockey League’s (OJHL) Wellington Dukes, winners of the Dudley Hewitt Cup. The next day, they suffered a 3-2 loss to the host Chilliwack Chiefs of the British Columbia Hockey League (BCHL). A 3-2 shootout loss to the BCHL’s Wenatchee Wild (who captured the Doyle Cup) led the Junior Senators into their final game in the round robin against the Manitoba Junior Hockey League (MJHL) and AVANET Cup champion Steinbach Pistons. This time, the overtime nail-biter came out in favour of Ottawa, who picked up a 5-4 win. Facing the Chiefs in the semifinal, Ottawa took a 2-2 game into the third period, but when Chilliwack hit the tiebreaker with about ten minutes left, the Junior Senators had no answer, as they fell 3-2. Veillette and Guy had both of the goals for Ottawa. For their part in the series, Guy and Veillette have combined for 3 goals and 3 assists. Guy’s first goal of the tournament helped send the game against Steinbach to overtime. 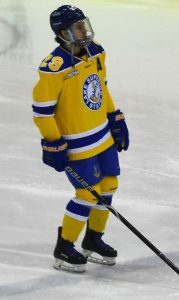 The last Laker prospect to play in the RBC was Owen Headrick with the Soo Thunderbirds of the Northern Ontario Junior Hockey League (NOJHL) in 2015. The T’Birds made little noise in that rendition of the cup, held in Portage la Prairie, Manitoba, as they lost all four games in the round robin. Among members of the 2017-18 Laker squad, senior Ryan Renz’s Vernon Vipers (BCHL) hosted the Cup and made it to the semifinals. No current members of the team won the Cup before leaving junior hockey. SAULT STE. MARIE — Lake Superior State will have co-captains for the upcoming season. Current juniors Gage Torrel and Diego Cuglietta were announced as team captains for the 2018-19 season by head coach Damon Whitten during the annual Soo Blue Liners Banquet on Thursday. In addition, junior Anthony Nellis and sophomore Collin Saccoman were named assistant captains. Torrel, a native of Monticello, Minnesota, served as an assistant captain during the 2017-18 season. He was named Outstanding Freshman and Offensive Player of the Year during his first season with the Lakers. In that first season, Torrel was named WCHA Rookie of the Month for December and February. Over three seasons with the team, he has scored 27 goals and added 30 assists for 57 total points. This past season, Torrel had 16 points — good for sixth on the team. He received the Jim Howie Unsung Hero Award at the conclusion of the year. Cuglietta will don the other C as the most recent recipient of the team MVP award. A steady point producer from Kamloops, British Columbia, he finished the season tied for 2nd on the team (with Max Humitz) with 23 points. Known for his speed, Cuglietta has been a presence on the ice in all situations. Nearly half of his 25 career goals have come on special teams (8 power play goals and 4 shorthanded tallies). Nellis, another junior forward, has been a consistent contributor for the Lakers in his first three seasons. His goal total has risen each season, from 4 his freshman year, to 9 the previous year, to 12 this past season. This season saw the native of Breakyville, Quebec, tally 19 total points. His previously mentioned 12 goals were 2nd most on the squad last season. At the recent Awards Banquet, Nellis was named Offensive Player of the Year. The only one of the captains who will not be a senior next season, Saccoman was noticed right off in his freshman season for his prowess at blocking shots. 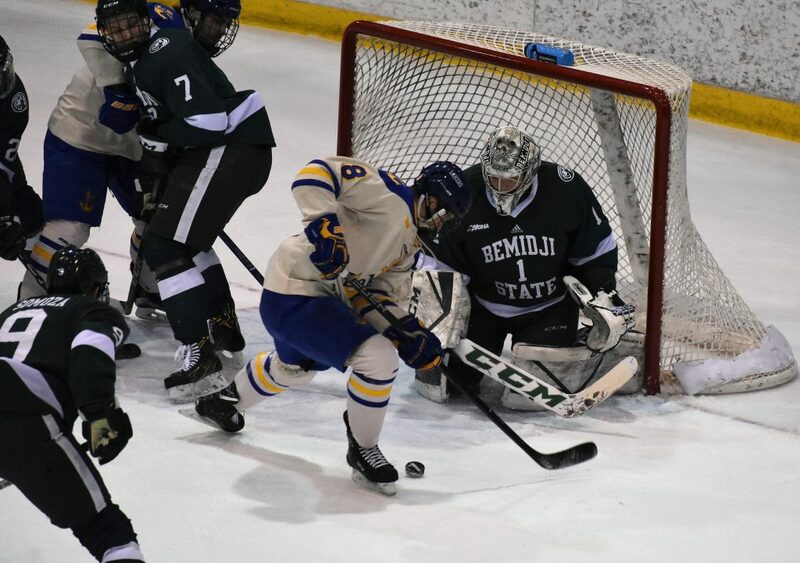 His 94 blocks were the most in the WCHA during his freshman year and the 4th most nationally. Saccoman led the league again last season with 81. Perhaps most impressive about his total from his sophomore campaign is that he had 11 more blocked shots than the next closest player (Joe Rutkowski of Ferris State), despite playing in just 27 games. Although he suffered a bit of the sophomore jinx in scoring (18 points in 2016-17 versus 5 in 2017-18), his presence on the blue line is felt. Junior forward Diego Cuglietta was named team MVP for the 2017-18 season at the Soo BlueLiners Banquet on May 3rd. SAULT STE. MARIE — Junior forward Diego Cuglietta took home the Most Valuable Player award at the 2018 Soo Blue Liners Banquet, held at the Christopher Columbus Hall in Sault Ste. Marie on May 3rd. The native of Kamloops, British Columbia was named MVP by his teammates at the 35th annual banquet put on by the Blue Liners. Cuglietta finished the season tied for 2nd on the team in scoring with seven goals and 16 assists for 23 points. Sophomore Max Humitz matched Cuglietta’s mark, and both were passed by only senior J.T. Henke. To this point in his Laker career, he has 25 goals and 34 assists for 59 points. Cuglietta has been a presence in all aspects of the game, as his 12 career special teams goals (8 power play, 4 shorthanded) would indicate. Breaking from his tradition of waiting until shortly before the season starts, head coach Damon Whitten announced the team captains for the upcoming season, of which Cuglietta was named co-captain, along with Gage Torrel. Assistant captains were also named, in Anthony Nellis and sophomore defenseman Collin Saccoman. Taking home the Jim Howie Unsung Hero Award was junior forward Torrel. Torrel, an assistant captain this season, had been named Outstanding Freshman and Most Valuable Forward in his freshman year. Although his production dipped off a bit from his first two years, his presence and leadership on the ice was felt by his teammates and coaches. For the second consecutive year, the Most Improved Player award was presented to a freshman. Forward Chase Gamelin, a native of Soo, Michigan, followed Brendan McKay as the recipient, who won last year as a freshman. Gamelin, who did not play until early November, made the most of his time in the lineup, eventually accumulating three assists. Among them was an assist on a game winner by Anthony Nellis that allowed the Lakers to sweep Alaska Anchorage on the road late in the season. The Most Valuable Defenseman award was given to a man quite familiar with the award. Senior Kyle Chatham won the award for the third consecutive year. A native of Belleville, Illinios, Chatham first was named MVD his sophomore year, the season in which he also was named Most Improved Player. Following the season, he had a brief stint with the ECHL’s Reading Royals. Not much of a scorer, Chatham nonetheless did have at least one memorable offensive moment this season, where he drilled a shot from the blue line late in the third period of a tie game to earn the Lakers a win over Ferris State. The Gay Blade Award, which has held many different interpretations through the years, has been awarded to the player that keeps a positive attitude during the year in recent seasons. This year’s recipient was Laker newcomer Steven Ruggiero. A draft pick of the Anaheim Ducks, Ruggiero came to the Lakers via Providence College (Hockey East). As a transfer, he had to sit out until the mid point of the season, but made himself known both on the ice and in the locker room. The Outstanding Freshman Award went to Hampus Erikkson, one of three rookie forwards for Lake Superior this season. Erikkson, who hails from Forsbacka, Sweden, led all freshman in scoring with 4 goals and 6 assists. He was one of eight players on the team to score double digit points. Listed at 6’6″, Erikkson was the tallest player on the team this season. For the third straight year, the Most Valuable Forward was a member of the 2019 graduating class. Anthony Nellis followed in the footsteps of Torrel (2016) and Mitch Hults (2017) with a fine effort on the ice. His 19 points were fourth most on the team this season. Among his 12 goals were two game winners late in the season, both of which came on the road at Alaska Anchorage. A native of Breakyville, Quebec, Nellis has improved his goal output each season, from four his freshman year, to 9 last year to his 12 this season. Receiving the BlueLiners Player of the Year was leading scorer J.T. Henke. Henke, who led the team with 27 points, ends his Laker career with 79 points in three seasons. 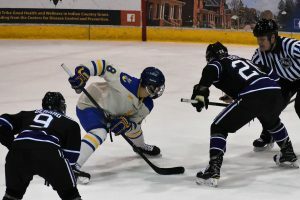 After playing his freshman year at the University of Maine (Hockey East), he transferred to Lake Superior, where he quickly became a force in the Lakers’ lineup. Among his accomplishments are finishing 1st or 2nd in scoring each year he has played for the Lakers, as well as scoring the most recent hat trick for Laker player. This was the second year he was named BlueLiner Player of the Year, after last season. In addition to the regular awards, pucks were presented to players for either scoring their first goal or earning their first win (in the case of goaltenders) as a Laker. The three seniors in attendance (Chatham, Ryan Renz and Aidan Wright) each gave speeches, addressing their time in the Laker program.